"These delicious breakfast cakes are said to resemble those from a famous pancake house. When replacing milk for buttermilk, increase lemon juice to 1 1/2 tablespoons. Serve topped with butter." Mix the buttermilk, vegetable oil, and vanilla extract in a bowl; stir in the sugar. Whisk in the flour, baking powder, baking soda, and salt, combining the batter with just a few strokes to moisten. Leave the lumps. In a separate bowl, whisk the egg and lemon juice together; gently stir into the batter. Refrigerate the batter for at least 30 minutes, up to 1 hour. Heat a large skillet over medium heat and grease with the butter. Pour 1/3 cup of batter per pancake into the skillet and cook until bubbles appear on the surface, about 2 minutes. Flip with spatula and brown the other side, about 2 more minutes. 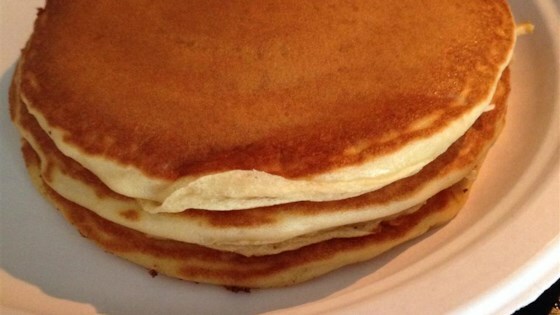 These fluffy hotcakes resemble those from a certain pancake house. After trying several times to make this recipe, I'm afraid that I'm not satisfied with it. This is very good. I will make pancakes with a resting time from now on. I did add frozen blueberries just because I do like them so. Thanks Drew!